BOSTON, Mass. - Northeastern came up short in a 2-0 loss to #1 Boston College in its sold out home opener despite a very evenly-paced game. Each squad registered 35 shots on net, but a late powerplay goal in the third period from Steven Whitney was the difference in the Huskies' second-straight Hockey East match. 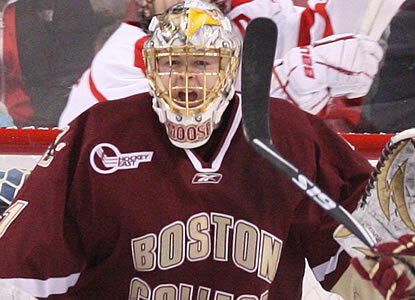 Boston College goaltender John Muse was the crux in the Eagles' triumph as the veteran backstopper put the Huskies' 65-game of not being shutout to rest. Northeastern tested Muse time and time again, but the Huskies missed out on a couple open looks and went 0-6 on the powerplay. Boston College converted 2-of-4 chances on the evening. The Huskies slip to 0-2-0 on the season with both defeats suffered in Hockey East play. Sophomore goaltender Chris Rawlings stopped 33 shots in his second start of the year. Northeastern gave the Eagles an early advantage when rookie Luke Eibler was cited for cross-checking just 19 seconds into the first period, but Chris Kreider made it a 4-on-4 situation at the 1:02 mark. With each side short a skater, the Huskies applied heavy pressure on Muse. Senior captain Tyler McNeely had the best look as he tried to swat a loose puck trickling around the goalmouth, but Boston College's defense slapped it away before NU could dump it in. Veteran Steve Silva was sat down for a slashing call later in the first frame at 17:21, but Northeastern's penalty kill rose to the occasion and fended off the Eagles' attack. Boston College enabled NU with a powerplay chance right off the bat to start the second (Tommy Cross - roughing at 00:59), but the Huskies could not convert. Sophomore Garrett Vermeersch offered up the best opportunity after chipping the puck out of a pile in front, but the puck nestled into Musevs chest, stopping play shortly after. At 7:06, a cross-checking call was assessed to rookie Jamie Oleksiak, but was negated thanks to an embellishment call given to Joe Whitney. The Eagles had ownership of the puck for most of the two-minute window, but Rawlings spurned any Eagles' advances with a slew of sturdy stops. Freshman Zak Stone raised Matthews Arena's pulse near the halfway mark of the second with a nifty toe drag across the crease, but Muse denied the rookie by staying in position and fending off the shot. BC killed off a Cross tripping call at 11:09 followed by a Whitney holding infraction at 15:18. Northeastern nearly broke the stalemate after newcomer Anthony Bitetto sauced a perfect backhand pass to senior Wade MacLeod on the near side, but Muse was able to snuff out the play and cut off MacLeod's angle to keep the game scoreless. The Huskies closed out the second session with a 5-on-3 for 28 seconds, but NU couldn't capitalize. Philip Samuelsson was penalized for cross-checking (17:58) followed up by Whitney's roughing call at 19:26. The third period started off with a flurry of chances for each squad, but sophomore Steve Quailer's missile put the biggest scare into BC. Quailer soared down the far side and snapped a wrister that beat Muse glove side around the 9:30 mark, but the puck was met by iron as mere inches kept the scoring at bay. Steven Whitney finally broke through on the scoreboard, connecting on a one-time pass from his brother, Joe Whitney, at 12:41. Jimmy Hayes fed J. Whitney at the point and discovered his brother on the low post. S.Whitney cradled the puck below the left circle and flung it top-shelf for the powerplay marker. Rookie Anthony Bitetto's interference call at 11:45 offered up BC's extra-man edge. Rookie Cody Ferriero put one last charge in the Eagles' defense in the waning moments, but the newcomer was denied the opportunity to lock the game up. The Huskies were charged with a too many men call at 19:17 (served by Braden Pimm) and Brian Gibbons closed out the contest with an empty net goal with 10 seconds remaining. Northeastern returns to Matthews Arena next Friday to take on RPI on Oct. 15 at 7 p.m. NU will only play one game next weekend for its first non-conference bout of the season.